Wedding season is upon us, and our coolers are just bursting with color. 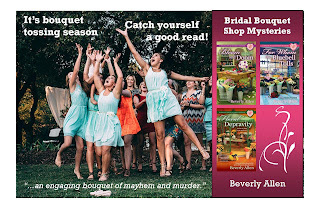 All kinds of lovely blooms for our June brides! And, of course, my personal fridge is stocked to the point of bursting for a big barbecue tomorrow: hot dogs, hamburgers, and a fat, juicy watermelon. Nick even helped me clean up the old fire pit for s’mores in the evening, if the mosquitoes don’t eat us alive first. Chester and Luna have already started circling my ankles, begging for their share of leftover burgers. But before we start with any of that, it’s time to put in a few more hours in the shop, breaking out the red, white, and blue flowers for Memorial Day, or as Grandma May used to always call it, Decoration Day. We see a few folks come in for graveside flowers—or sometimes just a single red poppy, used to honor our fallen troops since Flanders Fields in WWI. And yes, many go for the real deal instead of the artificial ones, to show off at the big parade. Flowers have been a big part of Memorial Day from the beginning. In fact, that’s how it all got started, when a group of women honored the fallen soldiers at Gettysburg by decorating their graves with flowers. Unfortunately, we’ve added a few more wars and many more fallen soldiers to commemorate. So, as you enjoy your weekend with family and friends(and you should—these are the freedoms that those men and women gave their lives for! ), take time to place a flowers on a grave, wave the flag at a parade, hold your loved ones close, and/or join in for one minute of silence at 3pm on Memorial Day for the National Moment of Remembrance. Oh, and please, leave the onion out of the potato salad. 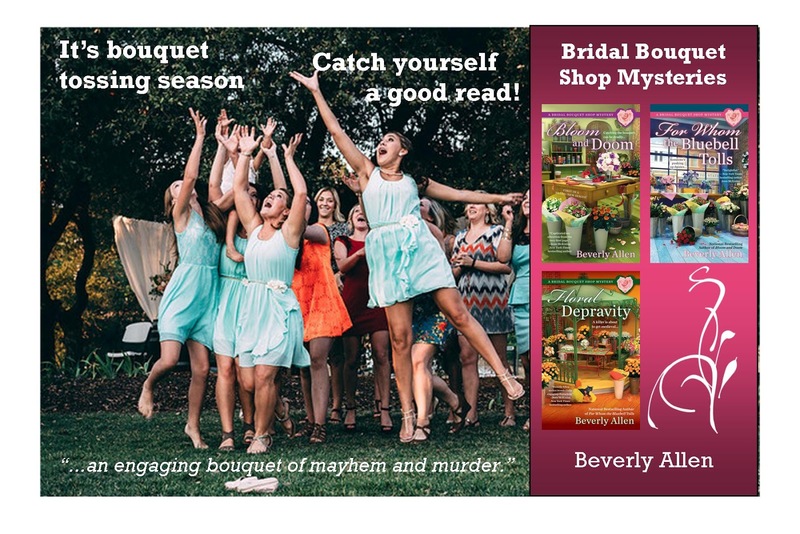 You can read more from Audrey Bloom in the Bridal Bouquet Shop mysteries by Beverly Allen, from Berkley Prime Crime. Lovely post. I do hope we all take time to remember those who made the ultimate sacrifice for our country and it's people. Especially at a time when we have so many still serving in this volatile time. Thanks. It's so easy to get caught up in the excitement of a long weekend, that I think many of us need a gentle reminder of the reason behind it. I will spend a moment saying a prayer for the families of all those who made the ultimate sacrifice. thanks for a lovely post. I saw your post of Flanders Field this morning. Remembering all the families touched by loss. First we will be visiting my Grandpa's grave. Then we will be spending the day working on our garden, fixing out porch and having a picnic. It's the last family get together we will have before my husband has his surgery. Enjoy the time with your family--adding prayers for your husband's operation. I leave flowers at cemeteries, but admit to fake ones. The exception was when I was in Paris as a teenager. I bought real flowers and left the on Lafayette's grave. Well, the artificial would hold up better--but don't tell Audrey I said that!